How to book Bromo Midnight Tour package? Based on the heaviest tourist who always come to Bromo National Park until make very difficult to get enough accommodation near Cemoro Lawang especially on holiday season. When the weekday or weekend coming, most visitors stay in Hotel around Surabaya or Malang because all accommodation near Bromo Cemoro Lawang already full booked and the only way to enjoy the Sunrise by choose 1 night 1 day trip that start at 23.00 PM. This volcano has elevation about at 2,392 meters above sea level, It is located between at Probolinggo, Pasuruan, Lumajang and Malang Regency. The natural state also linked to valleys, canyons, caldera or sea of sand with an area of about 10 Km. 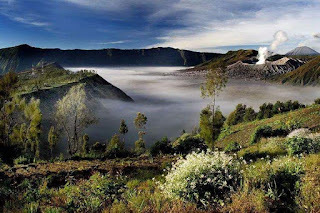 This mountain included in the Tengger Semeru National Park region, wherein several tourist objects can be visited such as, Semeru Volcano, Mt Batok and Kumbolo Lake lakes. Mount Bromo trip 1 night 1 day known as the easiet booking because no need to prepare the accommodation around Cemoro Lawang and all time always available the booking request for Bromo tour midnight. Before You decided to start 1 night 1 day trip, You must bring the suitable clothes with the volcano temperature in order You can make adaption on highest peak. For more information about booking requirements, You can visit Our booking form.